You've woken up locked in the back of a truck with no idea as to how you got there. What was just an average day, has turned into a nightmare! Crack codes, solve puzzles, and avoid the traps laid out by a dangerous serial killer! Move through different locations while your psychotic kidnapper watches you the entire way. Plot your escape in Trapped: The Abduction, a dark and mysterious hidden object game. Also available: Trapped: The Abduction Game Walkthrough. 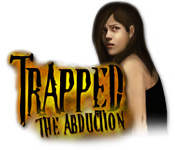 Trapped: The Abduction may be downloaded and purchased for $6.99 with a Big Fish Game Club membership. A demonstration version (92.80 MB) may be downloaded and played for free for one hour. Other popular games on our download Big Fish Mystery Games page include several Agatha Christie and Nancy Drew games, games in the Mystery Case Files series and in particular the latest, Mystery Case Files: Return to Ravenhearst, Adventure Chronicles: The Search for Lost Treasure, Enlightenus, Cate West: The Vanishing Files, Return to Mysterious Island 2: Mina's Fate, and Nick Chase: A Detective Story. Read our new game reviews by Ms. Terri: Nancy Drew Dossier: Lights, Camera, Curses! (Review), The Hardy Boys: The Perfect Crime (Review), Enlightenus (Review), and Nick Chase: A Detective Story (Review).